I've delidded my 7700k and it brought an enormous temperature drop for about 20-25 degree. Befor the delid I ran my CPU with 4,7Ghz and 1,35 Voltage and the temperature went up to almost 91 degrees. Do you think its a good overclock? Should I change something? thanks in advance for your answers guys! 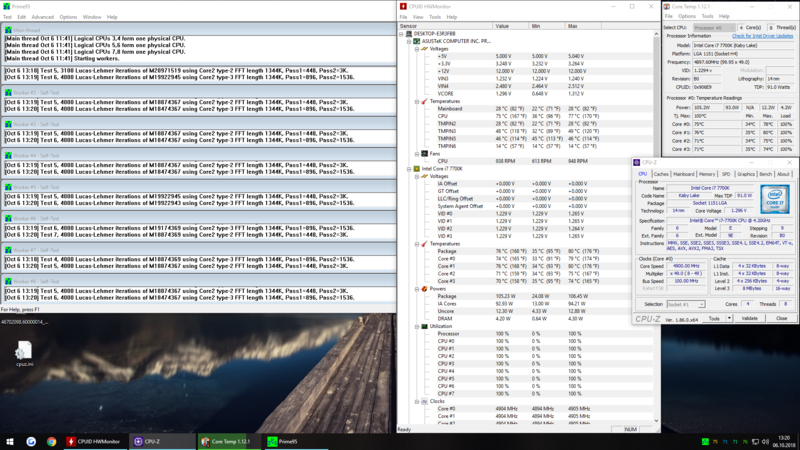 All I can say is that is very good indeed both on the 4.9GHz overclock and the temps...Also the vcore is great for that overclock. You must be happy!!! thanks so much Max! So I shouldnt try going lower with the vcore? have you tried 1.35v@5.0 yet? you can go ahead and see what vcore is needed for 5, just for farts and hahas. your temps might only be 3-5c higher, or they could be 10c, who knows lol. give it a try. i have a pretty good cooler, but my 8700k(delid) needs a relatively high 1.370v for 5.0ghz, but i have a decent cooler too and my temps are right at 80c@68f ambient. this summer i believe room temps were as high as 85f but just for gaming non stress testing i didnt go any higher than 82c, but that was when i was thinking about it and leaving HWMonitor running in the background. I didn't try 5.0 yet, but I have to say that delid changed everything! It went so good for me and I'm so happy I did it! I'll try and see what vcore is needed for 5ghz and let you know! Successful delid and Thermal Grizzly Conductonaut reduced temps by ~20C. 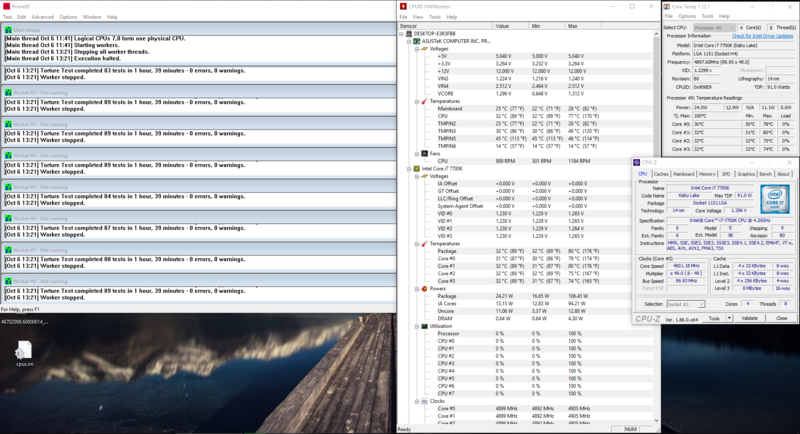 Achieved 5.0GHz 1.400V w/ max of 73C Prime95 (20 mins). What liquid metal did you use? *Full disclaimer: It no longer runs at those temps. I cleaned the liquid metal off and reapplied (because I was switching motherboards and thought I had too much LM and didn't want it to run, also thought there was lent from the q-tip in it) and it only made things worse. Now it won't even do 5.0GHz at all. used the same one as u did. that doesnt sound good at all man :/ sorry to hear that. I'm not too worried about it, 5.0GHz didn't give me any significant gaming performance increase over 4.5GHz. update: 1.36 & 1.37v also not working, got bluescreened again. I dont think I will change anything now, I got my stable 4,9ghz/1.3v with good temperatures. You have done well and 1.3v flat at 4.9GHz. Not sure whether playing around with the LLC would have helped on the 5GHz...did you try a high/Turbo LLC with the 1.35v overclock at 5GHz?. thanks, I guess I'm kinda lucky with my actual OC. I'm new to the whole 'OC Scene' and don't even know what I'm doing to a 100% . I saw a couple of things on youtube and set them up like that, but overall I didn't change 'a lot' in my bios. LLC is the Load-Line Calibration right? I set that up to Level 6.
when I tried 5GHz with 1.35v my temps got up to 82 degrees on one core but overall it was between 70-80 C and after 10-15minutes I got a bluescreen.